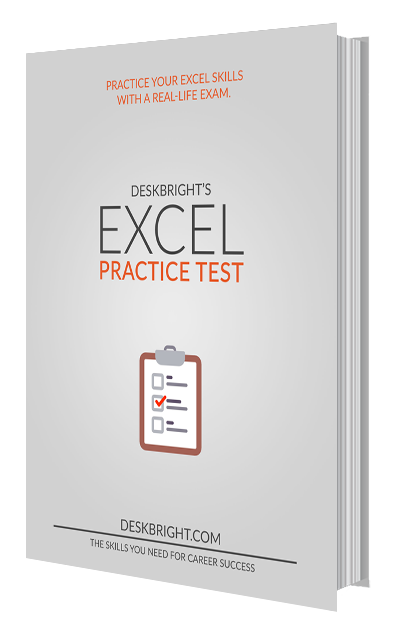 Prepare for your Excel test with a challenging practice exam. Taking an Excel test as part of an interview? It's a fact: Excel has become a must-have skill for modern job applicants. Used around the world for its infinite flexibility and high-powered analytical tools, Excel is required in functions like marketing, operations, sales, and more. That's why many companies today test job applicants' spreadsheet skills. These tests come in many forms, from Excel-related questions during in-person interviews through full-on simulated Excel tests and data analysis challenges. These days, knowing Excel formulas and functions isn't an option — it's a requirement. "I'm worried that my interviewer will ask me about a function I've never used before!" "I start shaking a little bit every time I open up Excel..."
"Could it be that I'm not qualified for the job?" "I want to do everything I can to get a leg up in the process." You would walk into your Excel test confident in your ability to knock it out of the park. You would be able to focus your time on other things, like preparing for interview questions and researching the company. You would be proud of your Excel skills and excited to show them off. And, most importantly — you might even be able to negotiate a higher salary based on the strength of your experience. Well, guess what? You can do all of those things. Download the practice test, test your skills, and use it to prepare for your exam. On the rare chance that you don't get the job, send me an e-mail within 30 days of your purchase and I will refund 100% of the cost — no questions asked. You don't have to return anything — just let me know and I'll issue a refund. It's literally that easy. If you don't get the job, you keep the practice test and get your money back. With zero risk on your end, you can't afford to pass up this amazing opportunity to ace your Excel test. Think about it: dominate the exam, and this book has already paid for itself a hundred times over. The product for excel practice test is basic level. Hi Sam, The product of excel practice test is very informative and having so many unknown shortcut keys.Thank you so much for your product for such a huge abundant knowledge .but it is having a basic type of questions. IT could be improved better by giving some scenarios instead of screenshots . As the description of the product says this gives important questions for the interview , but the standard asked in interview is different as they are focusing on scenarios. Hence it would be better. Thank you so much. I purchased this product, and the information was very valuable, but it turned out to be not what I needed. Sam was very helpful and resolved my issue efficiently. The Excel Practice Test is really a valuable asset. To be successful, you must understand the intricacies of Excel, so you can design, develop and implement high-quality work. You need to study AND practice a lot, and this product is a great tool to help you achieve that goal. Sam did an excellent job, and I'm glad to express my appreciation !!! I bought this Excel practice test ahead of an Excel assessment I had for a boutique retail consulting firm. While it was very useful for Pivot tables, I had multiple questions regarding "Search functionality" and using an INDEX MATCH across multiple worksheets that were not covered. Unfortunately, I do not expect to be advanced in the recruiting process for this firm.